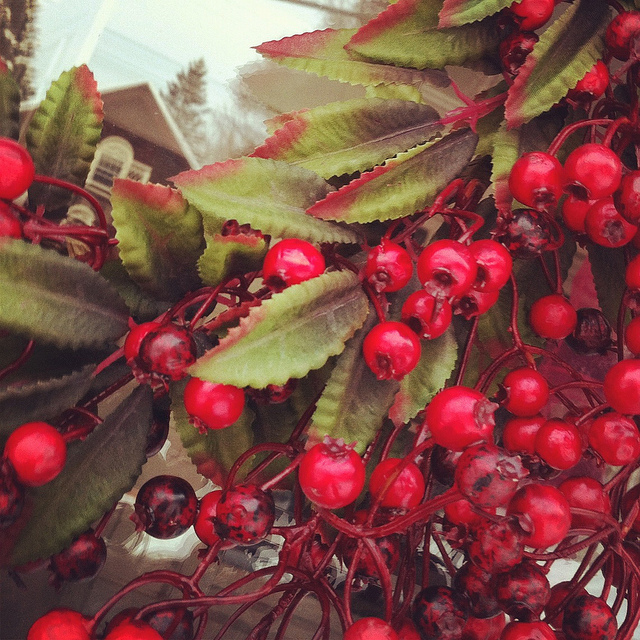 It's beginning to look a lot like Christmas...with lots of fake berries and leaves! Last week I found myself in need of a new wreath for my front door. The one I made a couple years ago was pretty much destroyed in a windstorm last year, and I didn't see any way to fix it. Nor did I feel much like making something else. The thought of not having a wreath on my front door for Christmas was just too much to take, so I quickly ordered an inexpensive one online. I figure it will do for this year, and if I have it in me next year I'll make one. Or buy a nicer one. Or something. This past Thursday, after the insanity that Thursdays bring, I plopped down at the computer to catch up on all the stuff one does on a computer. I have been expecting quite a few packages (it is, after all, Christmastime), so I started to check tracking numbers. All the packages were still en route, but my wreath had supposedly been delivered that day around noon with the note that it was left on the front porch. I hadn't noticed any package on the inside front porch or on the front steps. So, I got up from my computer and took another look. Nada. It had been snowing most of the day, so I even went as far as to dig a bit in the snow next to my front steps to see if it had fallen and been subsequently buried, even though that would have kind of been ridiculous because it was sure to be a fairly large package and we hadn't had that much snow. And then I started to freak out. This is what I do when something turns up missing. I freak out. A lot. (I'm working on it.) What happened to my wreath? FedEx said they delivered it. Did they deliver to the wrong house? Should I start knocking on my neighbors' doors? I don't even know most of my neighbors, though! What if it was stolen off of my porch? Who do I call about that? Do I call FedEx or do I call Amazon? What should I do? Where is my wreath? Freak, freak, freak. I decided that calling FedEx should be my first course of action, so I went back to my computer and started looking up the number. Here is where I found out that we live in such a remote area (okay, so I knew that part) that the FedEx drivers actually come in from three hours away every day. Wow. It took me a while to even find the number, and just as I was about to dial, Bria came into my office holding a package that could only be my wreath. "Mommy, did you just say a prayer about finding this?" I was in shock. Because, yes. Yes I had just said a prayer about being able to find the wreath (and to be able to stop with the freaking out—it's just a wreath). And then in walked Bria. Bria had answered the front door and some man (I'll assume it was one of those neighbors I don't know) handed her the box and said, "I think this belongs to you." Talk about a prayer answered at warp speed. This week's goal in Project Walking into a Hug is Pray Always. To make prayer a priority for ourselves and for our families. I think we do pretty okay with this. The fact that the first thing Bria asked when she brought the wreath to me was whether or not I had said a prayer about it tells me that we have taught her about prayer. However, there are always things to work on, and this week we will be focusing on making our prayers better, whether that be more sincere, more reverent or more often. And we can always improve upon the morning prayer as we are rushing out the door. We are quite proficient at saying it in the car on the way to church, for instance. And we are the world champions at saying a quick one at the front door before the mad dash to the bus each morning, often while the girls are still trying to put on boots, hats and mittens. How's that for reverent and respectful? What a memorable moment! I love it when things like that come together and I am so glad you got the wreath. All through your story I kept thinking that the UPS man probably hung it on the front door. Ha! SUch a great reminder, that we need to pray always, He always wants to help us and bless us. Love this post and that my Bria is in tune too. What a beautiful experience! I especially love that Bria recognized a prayer being answered. How sweet. Wow! that is a wonderful story, I think a plate full of home made warm cookies is warrented to a worthy and honest neighbor! win win both ways! Little miracles like that are what keep me in tears where God's concerned. How kind He is to care about the little things that aren't so little to us.